The Syrian war was immediately a carnage of ethnic groups and peoples. Most of the so-called "rebels" have always been made up of foreign jihadist militiamen, injected into the Syrian territory by the Western powers (United States, France, England) through their regional proxies (especially Turkey, Saudi Arabia, Jordan and Israel). A miserable part of the opponents of the "regime" is of Syrian origin but they all still agreed to slaughter the civilian population that did not intend to submit to those who considered themselves, wrongly, as the new masters of Syria. In almost seven years of conflict, many Muslims have been killed, most of the killed, but a different fate has certainly not come to the Christians of Syria who, when the militiamen paid by the West arrived, suffered enormous suffering and persecutions: cruel death, but also the humiliation of the dhimma, the religious tax imposed by the jihadists to non-Muslims. There was a period, not very far in historical terms, in which the Pope of Rome could have called to the rescue the Catholic France and he would have been heard. If France had ignored the request, there would have been the very Catholic Spain. Or Poland. Or Austria. Even the Kingdom of Italy would have answered. But not now anymore. The Pope did not bother to call and the Christian West, secularized, scientific, cosmopolitan, post-atomic and (sic!) democratic, had already resolved to use the poisonous scraps of a foreign religion to do the work for which it never had the courage to use his armies. The West did not abandon the Christians of Syria in the clutches of exalted murderers, drugged with the Captagon: it simply ignored them, if not as erasable terms. Obstacles removable without regrets on the path that led to the conquest of Russia and the subjugation of China. A Deir Ezzor lives (or lived) a strong Christian minority, mostly Armenians descendant by the survivors of the 1915-17 genocide perpetrated by the Dunmeh’s junta. In July 2014 the loyalist forces found themselves completely isolated and surrounded with the rest of the population in the governmental area (estimated at around 100,000 units). Supplies of food, water and basic necessities were made thanks to air bridges coordinated by the government of Damascus. American aircraft have often bombarded the besieged forces exterminating them, also affecting the population, to help guerrillas. On 17 January 2016 the ISIS militants killed at least 300 civilians, mostly women, children and the elderly. 150 of them were beheaded. Another 400 kidnapped. On 5 September 2017, after 3 years, 1 month and 22 days, the Syrian regular army managed to break through the western part of the city, breaking the long siege and rejoining with the 137th Brigade. In all these years, the West has cried only for the jihadists. Blondet writes the truth. The West has always and only cried for the jihadists. But certainly not Russia. Nor Syria. Nor Iran. To protect, to liberate, to save the Christians of Syria have always been others than the Western armies. The lions of the Syrian Arab Army. The braves of the Great Mother Russia. The generous of Hezbollah with the Pasdaran of the Islamic Republic of Iran. 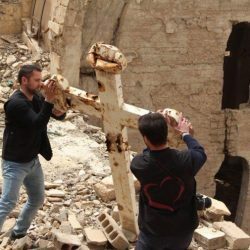 Not only in Deir Ezzor, where the cross was so symbolically raised on the ruins of a church but, first, also in Maalula and on the Qalamun. Ironically, it was Muslims who saved Syrian Christians from those who persecuted them. Certainly not the "civil" Nations of a West that is increasingly lost in its decadence. In the United States and Europe, our Western world, this Easter of 2018 will not be very different from the others. Perhaps in Syria.